The medium ball point and specially designed eye scarf help prevent skipped stitches and make this the perfect needle for knits, elastic or other stretch fabrics. System: 130705 HS. Size 1490. 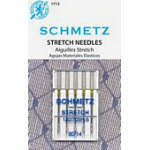 5 needles per pack. Carded.